I recently did a reveal post of Ethan's new music nook. 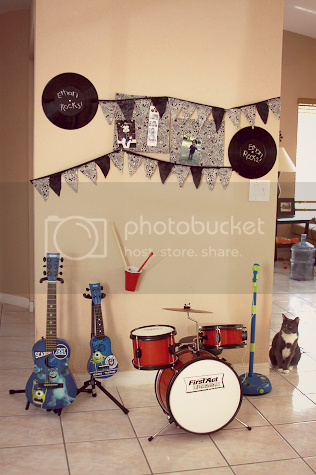 He basically has quite the set up for one heck of a toddler jam session! Music is an important part of our lives and exposing Ethan to music and the means to make it himself has always been a priority for us as parents. We are huge First Act Discovery fans. Ethan loves his perfectly-proportioned drum set (though he sure has a knack for losing the drumsticks) and we even gave a First Act Discovery guitar as a gift at a birthday party we went to recently. I love that First Act Discovery -- a for-kids branch of parent company First Act -- provides children with the tools needed to explore the depths of their creativity and play their hearts out on their quality, durable instruments. When First Act Discovery kindly offered to let Ethan review some of their new instruments based on the new film Monsters University, I was so super excited for them to arrive. 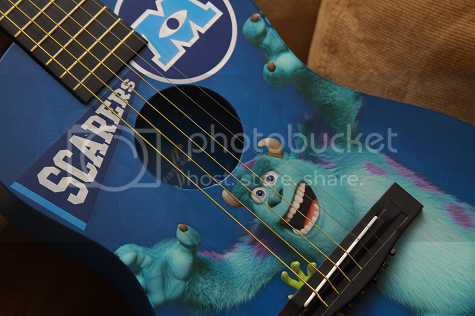 First Act Discovery sent Ethan a Monsters University ukelele, acoustic guitar and microphone (with a stand and matching amp!) to review. And review he did. 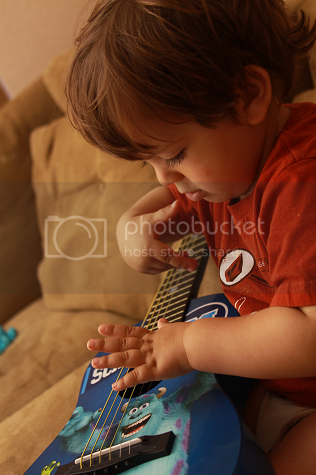 As soon as the delivery arrived one morning, Ethan was way more interested in exploring his new instruments than eating his breakfast. 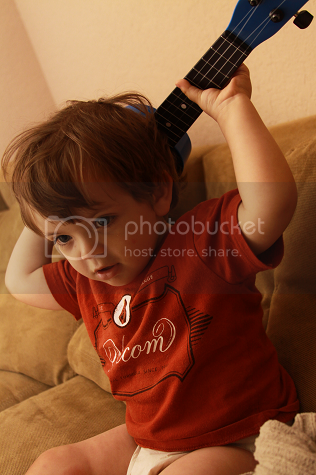 Immediately, he became smitten with the microphone, stand and amp. Ethan absolutely loved that his voice was amplified through the speakers when he sang into the mic. Admittedly for an almost two year old, Ethan's first instinct was to shove the microphone in his mouth and make humming noises into it. As the days have gone on, he's gotten the hang of trying to at least sing a few words into the microphone. Regardless, the first time he saw the microphone on the stand, he knew he was a rockstar. (He actually declared he was Billie Joe Armstrong.) From a parent standpoint, I love how compact this microphone set is. The less pieces something has -- as most parents would likely agree -- the better. No one wants to be scrambling to find missing pieces or attachments that have come off and gotten lost (I'm looking at you, Let's Rock Elmo, and your stupid little instrument accessories that are still hiding somewhere in the depths of my house, rendering Elmo himself useless while Ethan flails on the floor in frustration!). That said, the microphone stand is attached to the amp and features an easy knob to power it on as well as volume control. Emphasis on easy, because Ethan is able to turn it on, up or down all by himself without help. The amp being on the bottom of the stand also makes it pretty durable and solid when a two year old wants to swing it around because he really, really is sure he's Billie Joe Armstrong. 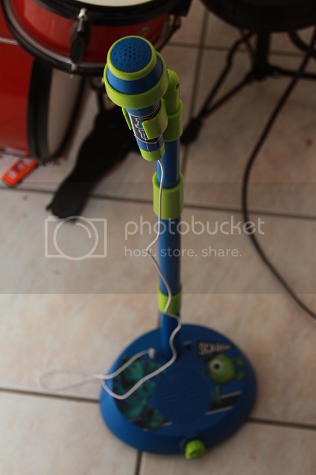 The microphone height is also able to be easily adjusted which is a huge plus for children who are inevitably growing, making it impossible to outgrow for quite some time. The microphone also comes out of the stand so your child can hold it in their hand all the while it's still connected via cord to the amp on the bottom of the stand (Ethan calls this being Jordan from New Found Glory, when he sings into the microphone in his hand and not in the stand). Ethan took to the ukelele immediately. 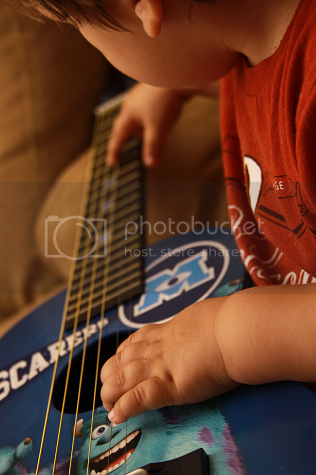 He initially called it the "baby boy guitar." 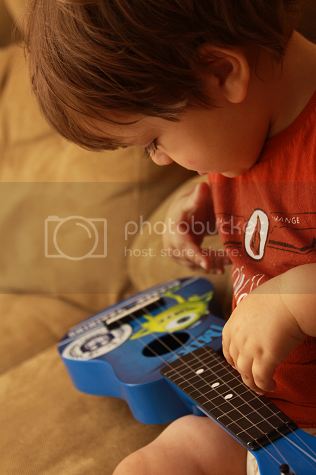 It fits perfectly on his lap for him to strum and he's determined to make the ukelele the official rock star instrument. 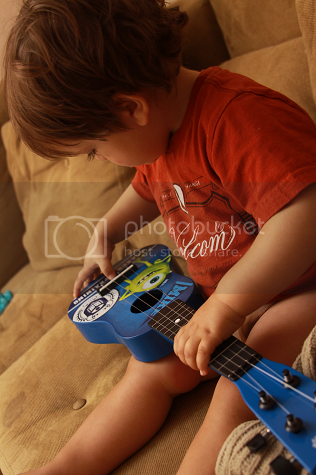 His favorite thing to do is "play" his ukelele while my husband or I play his acoustic guitar next to him. (Or "play" in my case, because I totally can't play an instrument, much to my dismay.) He loves to call out the songs he's playing, which is usually my cue to sing the words and he fills in the parts he knows, and we spend a ridiculous amount of time having these "jam sessions" every afternoon. They are some of my most prized moments! 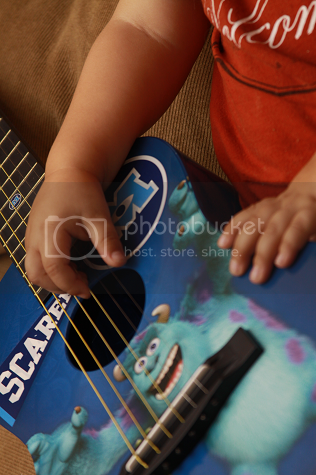 As a parent, I'm immediately impressed by the durability of the ukelele (and acoustic guitar). They sit happily on stands in Ethan's music nook, but that doesn't mean he hasn't ever knocked them off, or tried to hang them himself, or let one slide off the couch on accident due to sheer toddler clumsiness. The ukelele and guitar survive these incidents without any proof of them happening. Durability is a must when it comes to all things children, and I love that First Act Discovery puts this care into their instruments. This care to design and functionality is what really sets First Act Discovery apart from the other musical instruments geared for children that are currently on the market: they don't look and handle like toys, or like tiny replicas of instruments children recognize their parents playing but don't do the same things. They are actual instruments, perfectly sized, designed with children in mind and ready for children to play. And play Ethan does, all day, everyday! As I started this post out by saying: we are huge fans of First Act Discovery. As a parent and consumer, I completely appreciate the quality instruments (not toys) they make available to our children. There are few gifts greater than that of music and creativity we can give our children, and I'm grateful for all the fabulous instruments they create -- and how easy they make it to give our children the gift of music! 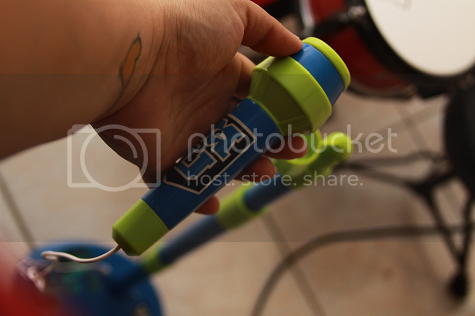 For example, if you don't have the space for a drum set, they have hand percussion instruments available. If your child has a favorite character, chances are they have it covered, too. (Disney Princesses, Hello Kitty, Monsters University, Spongebob Squarepants and many more, along with so many great designs and color choices for everything!) This is a great example of there being something for everyone and, even better, is First Act Discovery products are carried virtually everywhere, from big stores like Toys 'R Us to online retailers like Amazon. 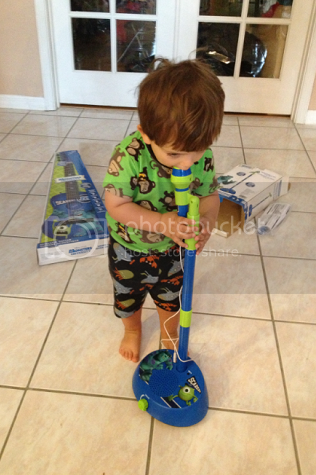 Ethan received these Monsters University instruments from First Act Discovery to facilitate a product review. No compensation was provided and all opinions expressed are completely my own. Each approach will suit one person but not necessarily another. Individuals need to find a style and approach that best suits them. These Musical Communities enable to the audience members, the Incumbent Independent craftsman/specialists submits there musical attempts to the networks for audit. Playlist Promotion Get your songs on Spotify playlists. Introducing music to children is vital. Our dad taught us guitar and bought us an organ when we were young. Since then we've learned to appreciate music.